Using the public betas? Do your duty and report bugs to Apple. 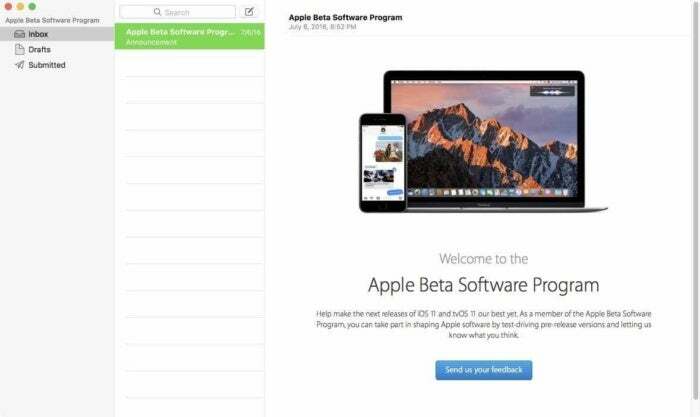 Apple’s public beta program is designed to get a larger pool of people testing the new operating system—more users, more devices, more edge cases, and hopefully a lot more feedback. Submitting bug reports and comments to Apple is your solemn duty as a beta tester, and Apple actually listens to and responds to those reports. 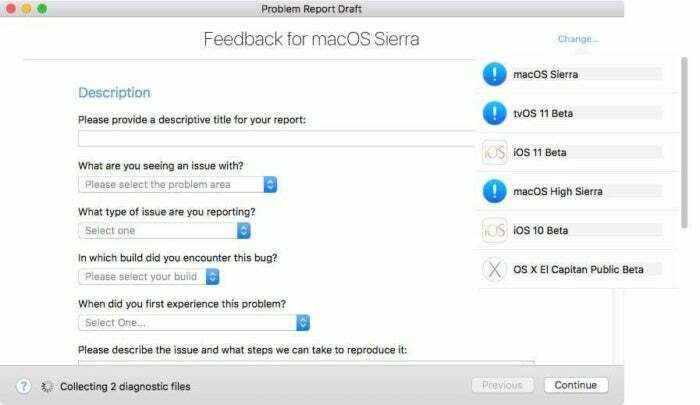 In the macOS High Sierra and Sierra public betas, you report issues through the Feedback Assistant app, and iOS 11 and 10 public betas has a Feedback app too. When you install one of these betas, the app is automatically installed. 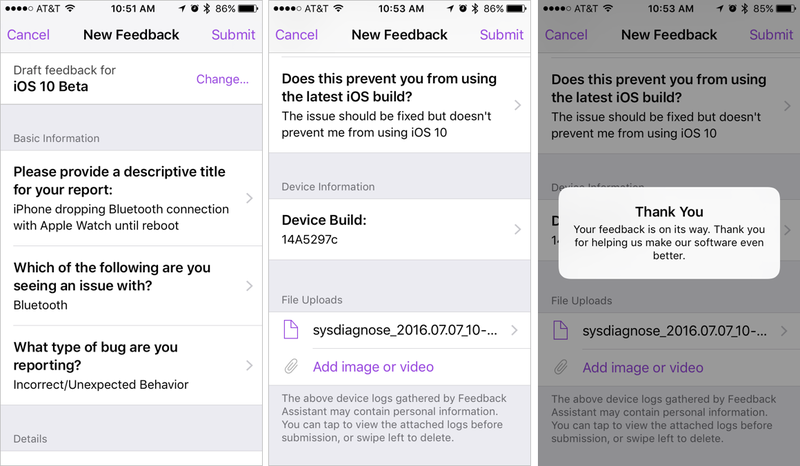 If you’re unfamiliar with Feedback Assistant, we’ll walk you through the steps of using it. To launch Feedback Assistant, go to /Applications/Utilities. You’ll find an alias of it there. It actually resides in /System/Library/CoreServices/Applications, but there’s no need to navigate there when you can just use the alias. 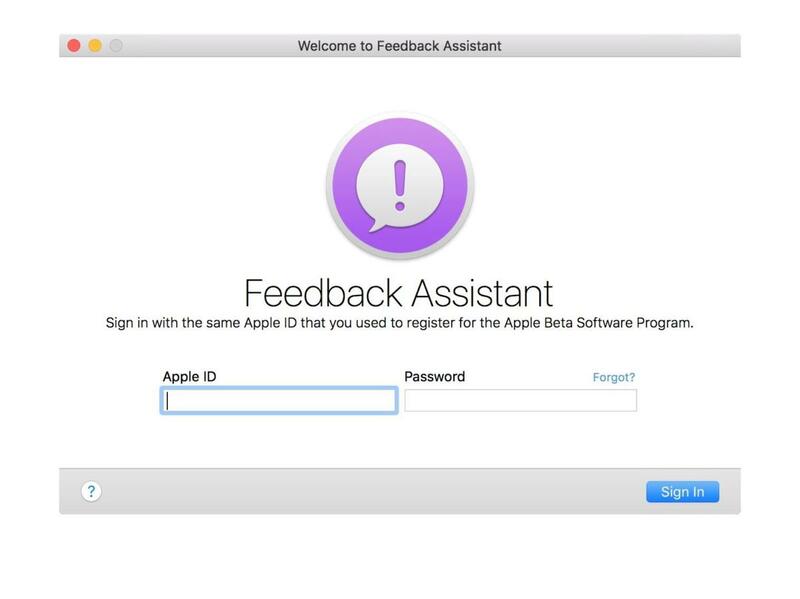 Once you launch Feedback Assistant and continue past the intro screen, you need to log in using your Apple ID. It needs to be the same ID you used to register for the Apple Beta Software Program. After you register, you’ll see an interface that looks a lot like the Notes app. (Ignore the message on the intro screen that says, “Help makes the next releases of...”) To report an issue, click on the New Feedback button icon button next to the search bar in the second pane, or click the New Feedback button in the viewing pane (if you have no feedback selected or have selected the welcome message), or type Command-N, or select File > New Feedback. When you create a new feedback report, you have to fill out a form. Click on the Help button on the lower left corner (the “?” icon) for guidance on how to fill out the form. You can even file reports for operating system betas by clicking on Change in the upper right and selecting the OS you want. Don’t be afraid to be detailed in your report. Write the specific steps you took to produce the problem. Explain what you thought would happen and what actually did happen. Note down any error messages. It’s more important to explain your experience than to try and provide your own diagnosis on why there’s an issue. And don’t think that someone else has probably already filed a similar report; multiple reports of the same issue can help raise awareness for the OS developers. Once you filled out the report and click Continue, you can add any files that may help the developer, like screenshots. 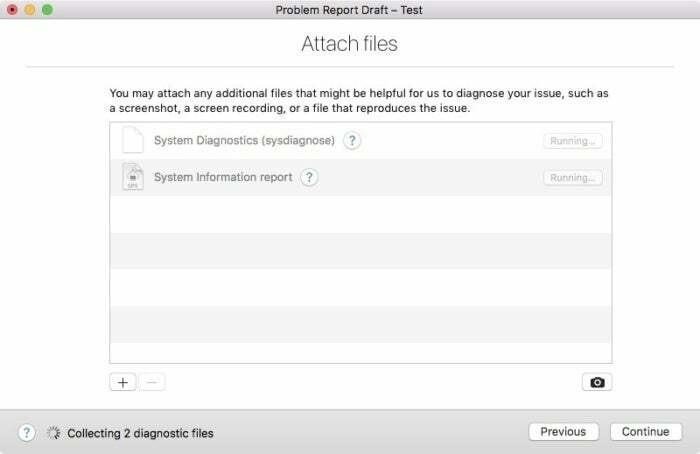 Feedback Assistant will attach a system profile and a compressed folder of diagnostic files. 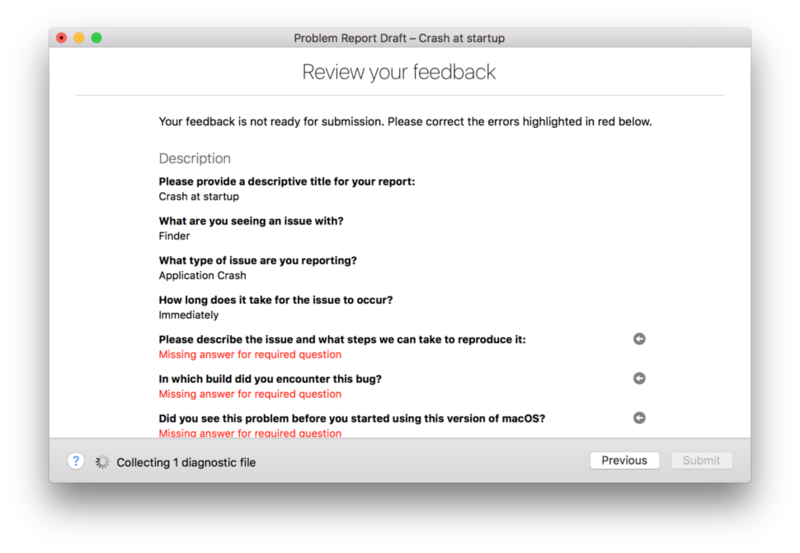 In the final screen, you can review your report. Click Submit when you’re done. Congratulations! You did your duty toward building a better OS. Keep up the good work! Before reporting a a bug in iOS, take a few steps to see if the problem is reproducable. Say you’re having trouble tapping a link in Safari. Try force-quitting the app (double-tap the Home button to get to the app switcher, and then swipe up on the Safari preview to quit the app) and relaunching it to see if that helps. Ditto with restarting your phone. It might not help, but at least you’ll be able to say in your report what fixes you tried. If the problem is with a third-party app, check the App Store’s Updates tab to see if there’s an update for the app in question—no point submitting feedback for a bug that’s already been fixed. You can submit a screenshot with your report, so if the bug is visual, go ahead and snap some proof! This won’t make sense for every bug, of course—it’s pretty impossible to get a screenshot of an app crashing. The Feedback app is pretty bare-bones, opening to a Feedback Assistant screen with the same kinds of folders you’d see in an email app: Inbox, Drafts, and Submitted. (Inbox is where Apple can leave notes and announcements for its beta testers, i.e. you.) To start a new report, click New Feedback, or the compose button in the top-right. At the end of the form, you’ll get a chance to add a screenshot or video, and if you’d like you can click the crash log attachments that are added automatically to give Apple’s engineers a more complete picture of what happened. After a reminder that the logs are being attached, you’ll tap Submit in the upper-right. Then pat yourself on the back for doing your duty as a beta tester!